Tonnages: 12,104 gross, 6,776 net, 17,520 deadweight. Main Dimensions: 527.1 x 68.1 x 29.11 feet. Cargo Handling: Fitted with two electrc cranes of 7.5 tons SWL and one Derrick of 8 tons SWL suitable for grab handling. Engine: 6 cylinder Sulzer 6RD 76 oil engine built by Fairfield Rowan Ltd Glasgow 9,600 bhp 15 knots. 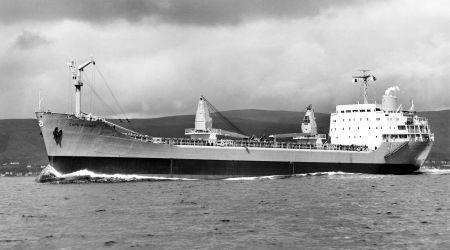 May 1965: Completed by Lithgows Ltd., Port Glasgow (Yard No 1154) for Lyle Shipping Co. Ltd., Glasgow. 1968: Management to Scottish Ship Management Ltd., Glasgow. 1970: Sold to Heilger’s Maritime Ltd., Pakistan flag and renamed OCEAN ENDEAVOUR. 1977: Sold to Pakistan national Shipping Corporation, flag and name retained. May 1984: Broken Up at Gadani Beach. The above pdf files were created by John Drury from literature supplied by Carole Mallett, daughter of the late Captain C.G. Mallett who joined Lyles in 1942 and retired from SSM in 1972.